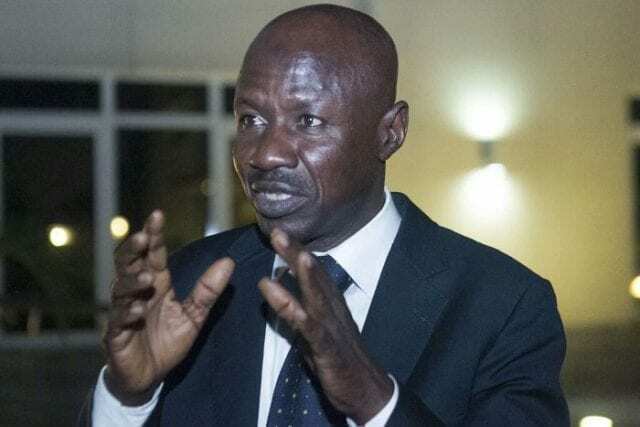 Ibrahim Magu, the Chairman of Economic Financial Crimes Commission (EFCC), yesterday paid a working visit to the office of Dr Joe Okei-Odumakin, the President of Women Arise for Change Initiative (WA). The EFCC boss said that his visit was to commend Okei-Odumakin’s support on the fight against corruption. “This is a long awaited visit; we have come here to say that the commission appreciates your effort and unflinching support on the fight against corruption in Nigeria. “We pray that you don’t relent in the good work that you are doing. “We are happy to associate with you and we pray well meaning Nigerians and other rights fighters will take a cue from you. “If every Nigerian can emulate you, the country will be better for us all,” Magu said. “Nigeria is bleeding under the weight of corruption that we can no longer ignore the prevailing mass poverty, hunger, unemployment, decayed medical and educational systems. “Others are poor infrastructure and absence of social services which are indicators of damaging effects of corruption. “Nigerians have suffered immeasurably from corruption and the time to own the War Against Corruption is now,”Okei-Odumakin said.